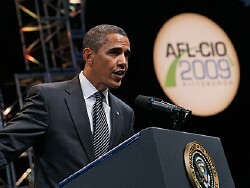 President Obama’s appearance before the AFL-CIO Convention in Pittsburgh yesterday sent this overwhelming message: his agenda and labor’s agenda are one. Organized labor has historically been the core of Barack Obama’s political base, and now that the President finds himself in a tough fight with corporate America, he is increasingly aligning himself with the labor movement. In Tuesday’s speech he stated, “when organized labor succeeds, our middle class succeeds, and when our middle-class succeeds, the United States of America succeeds. That’s what we’re fighting for.” For its part, the AFL-CIO and the rest of organized labor trusts Obama and is doing everything in its power to help him succeed. So when writers in The Nation or other progressive publications claim that Obama is betraying the working class, this is clearly contrary to the perceptions of the nation’s leading organizations representing blue-collar workers. Attending the national AFL-CIO Convention provides a great dose of political reality, particularly if you are from the San Francisco Bay Area or other progressive micro-regions. One soon learns that the leading organizations representing working people in this country trust President Obama to fight for their interests on health reform and the Employee Free Choice Act (EFCA), and reject the notion that he is “selling out” or “watering down” their agenda. And labor’s trust of Obama appears to be genuinely reciprocated by the President. He was at home among the labor crowd, and spent nearly as much time shaking hands with folks in the audience as he did talking. When Obama pledged to transform “Made in America” from a slogan to reality, he clearly meant it. When he talked about labor unions having to spend all their time negotiating around the latest health care increase instead of focusing on wake hikes, he clearly understood it. And when he insisted that “Health Care Can’t Wait,” and even led the crowd in chanting these words, the passion of his commitment to pass universal health care was beyond doubt. As I noted in describing Michael Moore’s comments about Obama, the left-wing of organized labor also trusts the President. For example, rather than attack Obama for not supporting single-payer — as many progressives do — the California Nurses Association accepted the AFL-CIO’s support for the “public option” alternative but pushed through a unanimous convention resolution that put the labor federation in official support of single-payer for the first time (Tim Paulson of the San Francisco Labor Council spoke in favor of the resolution before the Convention, emphasizing his city’s role as a model for the single-payer strategy). While many progressives parse out each Obama speech to assess his “true” commitment to the public option — for example, many of us thought he was a bit weak on this yesterday — labor has built its relationship of trust with the President and is moving accordingly. In the view of incoming AFL-CIO President Rich Trumka and all other national labor leaders, if the public option does not happen, it will not be due to Obama’s lack of effort. While labor trusts Obama, this feeling does not extend to his choice of candidates. Pennsylvania’s newly coined Democratic Senator Arlen Specter spoke at the Convention yesterday, and then stayed for two hours so that he could fly off to Philadelphia for a fundraiser with Obama. Specter faces a tough primary fight against progressive Congressmember Joe Sestak, and is seemingly directing every action toward winning this election. I’ve seen some cynical political displays in my day, but Specter’s speech made one want to take an immediate shower. Skipping the usual formalities, Specter said there were three issues that concerned labor: EFCA, health care and cap and trade. He said that he had made a deal in meetings with outgoing AFL-CIO President John Sweeney, Senator Tom Harkin and other Senators to give labor what it wanted on EFCA. In his Convention speech, Obama pledged to do everything in his power to pass EFCA, a point also emphasized by Labor Secretary Hilda Solis when she spoke on Monday. Here’s how it’s coming down: labor lacks the votes to win card check, and it’s a political lightning rod that is not as important as securing binding arbitration for the first contract, which is in Specter’s “deal.” The Senate is unlikely to enact progressives’ ideal version of EFCA, but Specter knows that if labor is not happy with the final version of EFCA, his re-election chances are nil. Bottom line: Specter transparently exposed himself as willing to vote any way labor wants so long as it secures his endorsement. And some might argue that if Specter can deliver on labor’s top two priority issues, it’s worth the deal. Be grateful if you don’t live in Pennsylvania and have to deal with the Specter-Sestak race. And as for the often-stated Joe Lieberman-Ned Lamont analogy, that turncoat never delivered for progressives – while Specter is putting himself in a position of having done so on labor’s leading issues. The AFL-CIO did more than any organization to mobilize in swing states to enact EFCA, so they are certainly the institution entitled to make deals around this legislation. After hearing speakers like Communication Workers of America President Larry Cohen, it is clear that labor will not accept any EFCA deal that does not meaningfully advance its interests.